In the middle of the day on Tuesday last week, a press release announced a groundbreaking ceremony for the first of a series of twelve homes to be constructed over the next 120 days in Sulfur Springs. 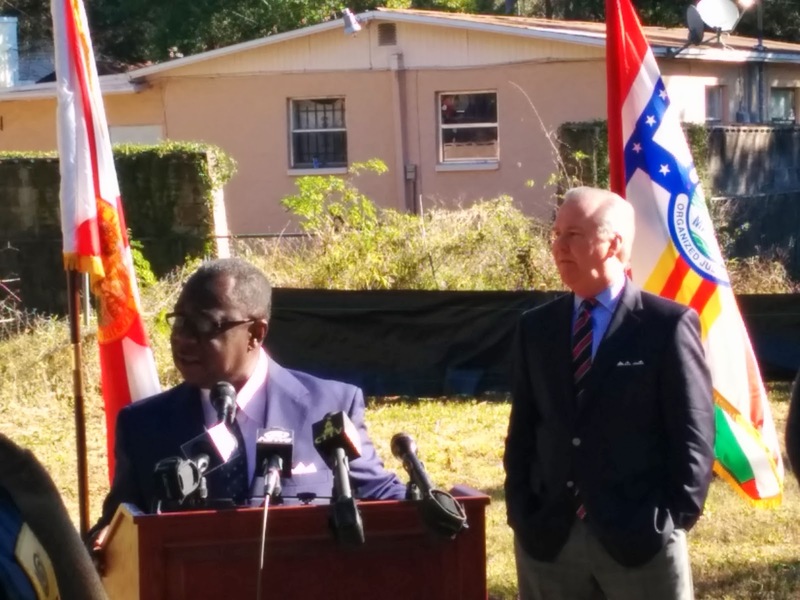 This ceremonial start to what Bob Buckhorn has named the Nehemiah Project would take place the following day at 10:00 in the morning. Though notice to the public was short, the event was well populated by a handful of concerned citizens who happened to get the word, several local news channels, a demolition company, a general contractor, subcontractors, code enforcement, Mayor Bob Buckhorn himself, other influential members of society such as Bob McDonough, Frank Reddick, and the Robinsons, seven golden shovels, and (finally) a buzzing work crew still clearing the last bits of debris just before the actual event. The Nehemiah Project was originally announced about a year ago as an effort to demolish 51 of the most dilapidated abandoned houses throughout the Sulphur Springs neighborhood. They have now torn down several dozen, and are beginning the construction phase of this vision that Buckhorn said Wednesday was the “renaissance of Sulphur Springs." Frank Reddick spoke just before the Mayor and said very plainly “we want to be sure to get the drug addicts and the prostitutes out of this community.” Since the beginning of this project, Sulphur Springs has seen 400 new street lights as well as a noticeable increase in police (and code enforcement) presence, facts used as points of pride alongside the 150 tons of debris removed from the community as Buckhorn spoke of their intentions to “rebuild this neighborhood” and “return Sulphur Springs to what we know it could be” — which means the “gang bangers” have to go. The city is using code and law enforcement to move criminals out. The criminals, by the way, are poor people in every case. Most of their crimes are crimes of poverty, such as theft, selling drugs, and selling their bodies. These crimes are ugly and dangerous, and some of the people they are talking about do indeed present threat. It is true that they are not conducive to a safe place to live, and it is understandable that some might not want to raise their children on the same block as a crack house, or walk their dog down the streets of the prostitutes and the needy. This is what happens in poor neighborhoods over and over, regardless of where they are. The poor get pushed from place to place, always towards the margins. Especially when there are non-poor families, ready to move in. This particular groundbreaking (in this particular neighborhood) needs to be understood through a much broader scope of trends in our city. Perhaps if one were to pull back far enough the event might be seen as part of a larger pattern, or fall into a clear relief among the broader scene. Over the week we will be posting pieces of that bigger picture with the intent of illuminating how this specific event is but an example of a much larger trend that is quite potentially problematic for the poor. We will look at how cities develop, the process of suburbanization, urban renewal (or gentrification), national and local economic trends which might help see our trajectory and better forecast where we are headed as a city.